Findings from our Bristol Swifts Survey 2015 were collated in September 2015 and these are the results and conclusions. As the first part of an exciting swift conservation project Bristol Swifts are working in conjunction with RSPB South West, Bristol Naturalists’ Society, Bristol Ornithological Club and Avon Wildlife Trust to try to gauge where swifts are nesting in Bristol and more importantly the colony size. To coincide with Bristol’s status as European Green Capital, all Bristol residents were invited to help us by counting swifts during 2015 using a form provided. The plan was to do surveys in May and July, as these months would normally provide good indications of swift numbers (May) and the success of the breeding season (July). However due to the poor weather conditions which contributed to the late return of many swifts, this survey was extended into June. We asked Bristol residents who wanted to take part during May or June to choose a dry, non-windy, warm day preferably sometime between 8-11am or 7-9pm to record screaming parties for a minimum of 10 minutes. A good guide to determine the colony size at this time of year is for every swift seen in a low level screaming party around buildings its mate will probably be incubating eggs nearby. Screaming parties only occur within between 25-50 metres of a known nest site, so for example four swifts seen flying low would indicate four nests locally. In July the aim was to re-count the total number of swifts at the end of the breeding season at the same locations. These screaming parties should be larger than those in May/June, as they would include virtually all the breeding adults, non breeders looking for their nest sites and maybe a few newly fledged young. These results should indicate the success (or not) of the breeding season in 2015. Screaming parties are a very good sign that there may be a nest nearby and much easier to record than precise nest sites, which are very difficult to locate. However the key to their long term conservation is finding swift nests and preserving them for the future. We asked for all the findings to be returned by 1st September 2015, so Bristol Swifts could analyse the data and add it to the website. 1. Over 90 completed surveys were received. Removing the duplicate surveys we identified approx 45 screaming party locations and also approx 30 nest site locations. 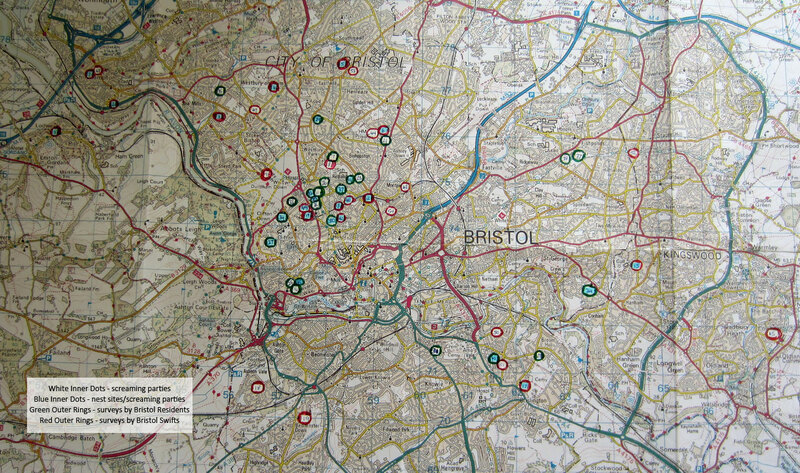 Following analysis of the findings the locations can be viewed Bristol Swifts Map Locations. 2. Due to the poor weather there were too few results reported from the same location in May/June and then in late July to be able draw any firm conclusions on this years breeding season. However based on our colony we had the same number of breeding pairs (7) as 2014. The main difference was that fewer non-breeders returned than compared to previous years and this contributed to the lack of screaming parties which gave the impression that their overall numbers were down. A similar scenario was reported in Bristol and right across the country. 3. Preliminary conclusions from the survey identified swifts nests in residential houses, the overall size of the colony tended to be small (containing 1-3 nests) and commonly spread over several roads. 4. The results were added to a map of Bristol, which does not include sightings in outlying areas such as Frampton Cotterell and Midsomer Norton. The blue dots on the map indicate both nest sites and screaming parties, whereas the white dots are screaming parties only. Click on map to enlarge and on link to Bristol Swifts Map Locations for specific roads where screaming parties and nests were reported in Bristol. 5. Returned surveys highlighted some potential swift hot-spots in the city such as Cotham and Redland. 6. Large parts of the city returned no surveys, although swifts are known to be nesting there, for example Withywood, Hartcliffe and Bedminster Down. This was due to no-one carrying out surveys in those areas. 7. Recording screaming parties has only limited value. In ‘swift hot-spots areas’ such as Cotham and Redland it is more than likely that the same birds were being counted over and over again in slightly different locations, giving a false indication of their actual numbers. 8. Recording actual nest sites provides a more realistic account of their true numbers in any given area. On the downside, finding their actual nest sites is difficult and time consuming. In our opinion to ascertain more accurate information regarding swift numbers it would be better to focus on finding nest sites. This could be done by asking enthusiastic individuals who know their own patch and have an understanding of where swifts might be nesting and what signs to look out for. 9. Bristol Swifts have worked with RSPB who undertake annual swift surveys and shared results regarding screaming party numbers and nest sites in Bristol, but respondents emails have not been included. Our hope is that our respondents add data to their Swift Survey in future so that it is centralised. Recording screaming parties was a fun thing to do, but we found the information gained from it was of limited value. It showed swifts are present over most of Bristol, but it was unreliable as a means of recording their actual numbers. As surveys were returned it became obvious that the same birds were being recorded by different individuals giving a false picture of their true numbers. We have spoken to the RSPB who record screaming parties numbers across the UK and they confirmed the same problem with the information they receive. They only use their data to show swifts are present in a particular location rather than a means of recording their actual numbers. They agreed that trying to count the breeding population in the UK is almost impossible. The best they can do is to get a feel of where swifts are living. They then monitor these locations on a yearly basis to see if swifts are still present and from this information they then can draw a reasonable assumption on whether their numbers are increasing or decreasing. In 2016 our survey will concentrate on receiving information of actual nest site locations rather than on screaming party numbers. We are considering asking enthusiasts from across Bristol who have already advised us about swift nest site locations to help us in an ongoing project. Our aim is to build up reliable information from these nest sites on a yearly basis. From this data we hope to be able to spot trends in swift numbers year on year and help conserve nest sites. Ultimately we will be in a better position to gauge of the overall state of the swift population in Bristol, i.e. is it increasing or decreasing. If you would like to help us with this project please contact us.